Playing striker in the FIFA World Cup semi-final for your country against the might of the European Champions, Spain, would be daunting for most, if not all, of us. But for Miroslav Klose, Germany’s star player of the tournament in South Africa, he’s not that concerned. No. His real concern is the fact that his team mates want a Miroslav Klose speech to mark his 100th appearance for his Country. Remarkably, he’s not that concerned that he is now in pole position with Gerd Mueller as Germany’s leading World Cup goal scorer. Nor is he that concerned that he has a real chance of achieving the 15 goals scored by Ronaldo of Brazil. Though he does fancy his chances! So, a footballer of few concerns. It’s no small achievement. Hence, the speech. That’s his concern. The landmark of 100 matches for Germany went unnoticed with the quarter-final game against Argentina. Undoubtedly his team mates won’t let it go unnoticed much longer. 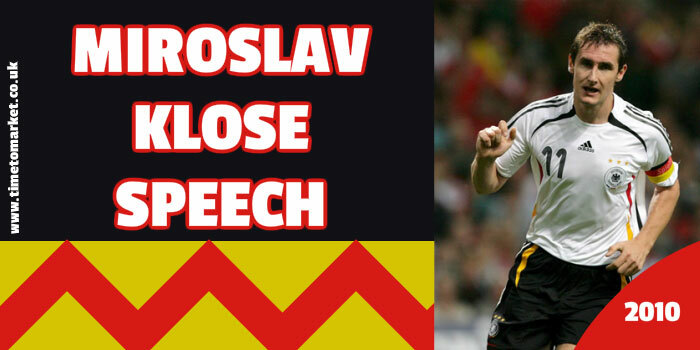 Because they want to hear, by all accounts, a Miroslav Klose speech to them all. It’s revealing to know that even with Klose’s precision finishing and apparent nerves of steel, the matter of a speech to immediate colleagues makes him a touch apprehensive. It’s not just harried time-poor business executives that feel speech anxiety about giving presentations or speeches. We have even seen a figure stuck in an elevator with a fear of public speaking. However, we reckon that Mr Klose is too cool a character for that. Here’s hoping that his footballing nerves remain intact in the Durban stadium for tonight’s big match. So, if you want to calm your nerves before your next speech then you can turn to us. Because a public speaking coaching session should give you all the confidence you need to make your next big speech. So, please don’t hesitate to call us for more details or to discuss a schedule.